Specialist power and water consulting firm Entura has completed the Technical Feasibility Study (TFS) for Genex Power’s Kidston Pumped Storage Hydropower Project in North Queensland, Australia. The TFS concludes that all of the key risks identified at the pre-feasibility stage, and any additional risks identified during the study, have been appropriately mitigated or addressed through detailed design augmentation and optimisation undertaken by Entura and project partner HydroChina. “Much of the work undertaken by Entura was focussed on optimising the project to achieve a design which is technically and commercially feasible,” said Genex Power Managing Director Michael Addison. Entura Project Director and Principal Consultant, Civil Engineering Richard Herweynen said that a number of project size options ranging from 200 MW to 450 MW were developed as part of the TFS. “Following detailed market studies undertaken by Genex and its financial consultants to assess the pricing and revenue impacts of the various options considered, it was determined that a 250MW scheme with six hours of continuous generation, totalling 1,500 MWh of energy storage capacity, would be the optimal size,” explained Mr Herweynen. Genex and Entura continue to engage with a number of highly experienced and well recognised EPC Contractors and Generator/Turbine Suppliers to develop the anticipated capex estimates. Formal competitive tender processes will be undertaken over the course of the next phase of the project development. 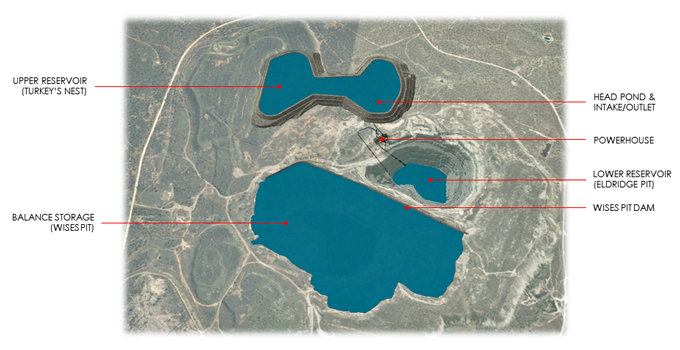 The Australian energy market has evolved significantly since the initial inception of the Kidston Pumped Storage Hydropower Project. Further significant evolution in the market is expected as generation mixes shift from traditional fossil fuel generation towards increases in large scale renewable energy generation. There is a critical need for large scale energy storage, at an affordable cost, to balance the penetration of large scale renewable energy generation into Australia’s National Electricity Market. Pumped storage hydropower projects are a natural fit in an energy market with high penetration of renewable energy as they help to maximise the use of the renewables that are subject to the vagaries of the weather. Pumped storage provides a load when the wind is blowing and the sun is shining, and it also provides a source of energy when the sun has set and the wind has dropped. Entura has worked with clients in more than 30 countries over the past few decades – including India, Laos, Malaysia, Papua New Guinea, South Africa and Tajikistan – assisting with developing, operating and maintaining hydropower assets of all sizes. The firm has also been involved in more than 100 advanced and operational wind farm projects in Australia and internationally, supporting development, renewables grid integration and connection studies. The full ASX announcement about the completion of the TFS is available here.